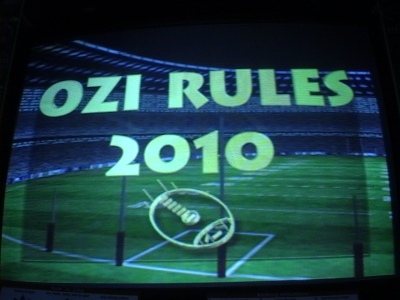 WFN recently stumbled across an old arcade game with the title Ozi Rules 2010. The unit is still in working order and features several countries competing in Australian Football, at stadia from around the world. We tracked down the developers of the game and asked them about when the system was made, how many were sold and what the response was like. We also learnt that one character was based on a real life enigma of footy, reported to drop punt the ball 70 metres but too shy to have a crack at the big time. The game was developed by Interactive Imagery, based out of Adelaide, South Australia. Gary Ford was the producer of Ozi Rules 2010, and worked with a team of artists and programmers for around 12 months to develop the final product. 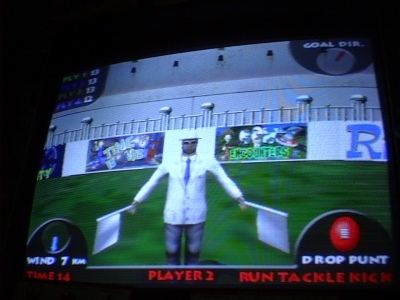 The arcade game used some cutting edge techniques, and was released around 2001. Unfortunately this corresponded to the exact time that such systems were losing popularity, with home based consoles all the rage and electronic poker machines filling Australian pubs and clubs. Ford says that they still managed to sell 20 to 30 units and the feedback was that average punter loved the game. In hindsight, Ford suspects that they would've had more success if they had been just a year or so quicker. And he should've gone with a cricket game first, to take advantage of the big New South Wales market, which back then was not receptive to Aussie Rules - the thawing remains a work in progress to this day. 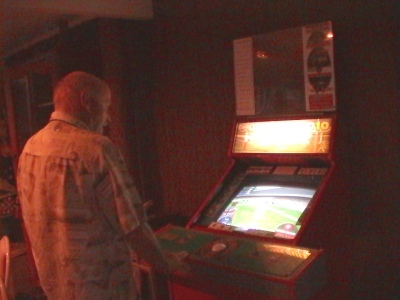 Rather than take on a full rendition of football, the developers targeted the game at blokes standing around a pub with a beer in one hand, having a competition with their mates (1 to 4 players). The three "events" implemented were kicking for goal, running at goal while avoiding tackles, and the long kick competition. In goalkicking, the player has to allow for the wind and make sure they get the accuracy and distance right. A nice feature is the ability to creep around on the mark when shooting from an angle - but if you go too far the umpire calls play on. Although the game looks a little dated compared with very modern machines, it's easy to see that it was quite advanced for its year. Ford has always loved Australian Football and was involved with South Australian amateur league club Glandore. He recalled scouting trips to indigenous footy carnivals, where he was the only white fella amongst hundreds of locals. He was a popular figure as the players knew he was a scout. But one player that really caught the eye was Bazza Buckskin. Ford tells of booming 70 metre (or more) drop punts, and that they even thought of trying to arrange an NFL tryout. But alas Bazza was too shy and not interested in the big time. Ford decided to pay homage to Bazza in Ozi Rules 2010, having him represent Australia in the green and gold. Other countries featured were New Zealand, the United Kingdom, Italy, Greece, United States and Vietnam. So how did he pick those countries? He mostly went for the obvious higher profile ones in Australia, including those that have had a lot of immigration to this country. So did Ford or one of his backers, Phil Creswell, know much about international Aussie Rules when the game was being made? They had to admit, not really. 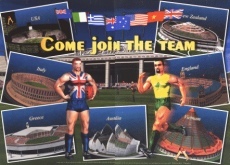 Let's hope one day we'll see a future home gaming system like Xbox or Playstation feature Australian Football, not only a version with AFL clubs, but one that let's kids imagine they're playing for their country - be it Australia, South Africa, the US, or any of the 30 or so countries now playing our sport. Have to say the US kit very much resembles the actual Revolution's actual one. 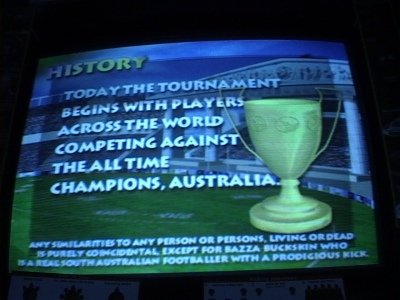 I am almost certain that I had seen and even played this game at a pub in Brisbane back in 2000 with some of my teammates, in fact if I remember rightly, I think it may even have been the old Red Fox on Melbourne Street in South Brisbane, as it was our club sponsor at the time. Was a bit of a laugh back then and would have attracted the attention of at least a few curious punters. Our recent article has spurred some further interest. Darren Moncrieff has now done a follow-up interview with the real life Bazza Buckskin for his website, Aboriginal Football. See here. on the US site Allstar.com by Kevin Beane - looking to learn more about foreign football codes by playing the video game versions of them. 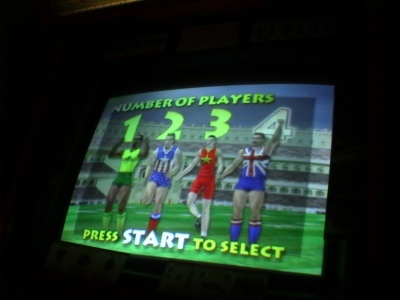 He reviews his attempts to play an old NES version of Aussie rules - quite unsuccessfully. But he provides a link to the site, so others may want to go there and play it.